We offer two solutions for remote monitoring – one a cloud-based VPN solution and the other a client/server VPN solution that makes a direct connection over the Internet. Both solutions provide simple, secure, remote access for system integrators to check in and view what is happening at job sites thereby saving time and resources from not having to send technicians to job sites for every customer problem that occurs. 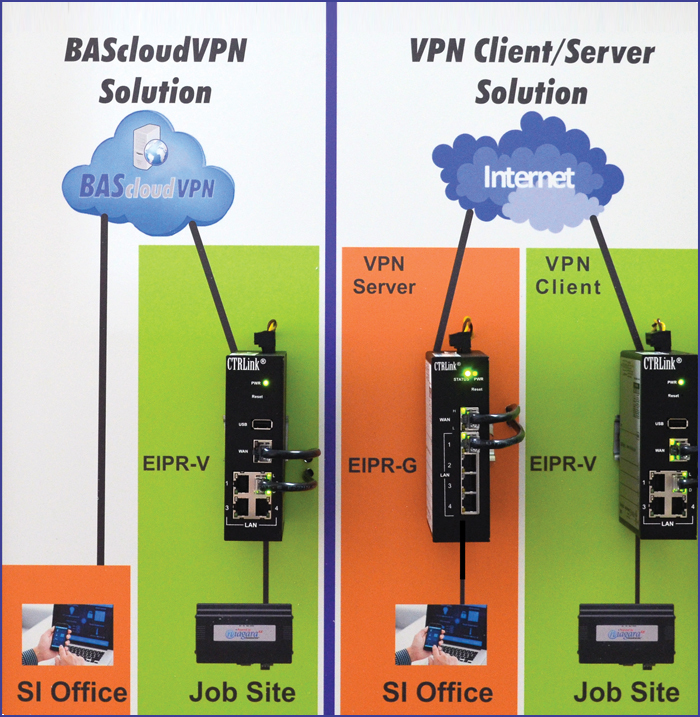 With the cloud-based VPN solution, the Contemporary Controls' hosted BAScloudVPN server provides the critical connection between two VPN clients – one installed on the system integrator's PC and the other permanently installed at the job site using Contemporary Controls' EIPR-V VPN router. Using this approach, two secure VPN tunnels are created with no concern for intervening firewalls. With the VPN client/server approach, an EIPR-G VPN Server located at the system integrator's office replaces the cloud server. The EIPR-V remains installed at the job site, behind firewalls, acting as the VPN client. Using this approach, two secure VPN tunnels are created with the added requirement that the VPN server at the system integrator's office must be accessible via the Internet thereby requiring a public IP address.